Winnie was stolen from the children’s center at Kalaklan, Olongapo City, where she was loved for her vigorous tail wagging and patience with little children. If a child was having a bad day, Winnie would help the child smile again. The dog meat trade is illegal in the Philippines, therefore it operates secretly which makes it almost impossible for pet owners to ever locate their pet again. A meeting was held at City Hall on December 7, 2015, where Mayor Ruben Paulino ordered his officials to investigate the reported dog meat trade in Olongapo City, where he promised to free illegally caged dogs because of the cruelty involved. Olongapo City residents in Kalaklan report that it is very distressing to hear non-stop yelping and wailing of dogs which are possibly people’s loved pets, being illegally held in small cages. There are two probable outcomes for stolen dogs: tortured and forced to become savage guard dogs, or slaughtered for human consumption. It is believed that Olongapo City has become a capture and collection point where dogs are bought and sold for the Filipino illegal dog meat trade. The dogs are then secretly trafficked across the country to Baguio and other dog meat locations, for human consumption. 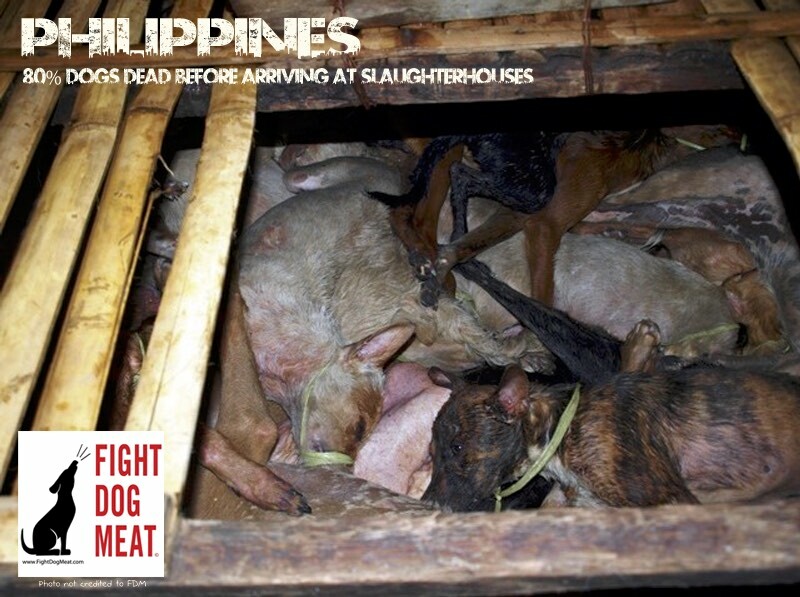 It is believed over half a million Filipino dogs are slaughtered every year in this illegal trade. Existing Filipino laws need to be enforced to save the Philippines from international embarrassment due to the country relying on tourist dollars to help prop up it’s flailing economy. In Baguio alone there are over 25 dog meat restaurants and four dog slaughterhouses. Laguna and Batangas have at least seven dog traders who buy and sell dogs for human consumption, and Pangasinan boasts two dog slaughterhouses. An unknown number of dog slaughterhouses, dog traders and dog meat eateries also exist throughout the Northern provinces. Olongapo City residents appealed to authorities to investigate the Kalaklan dog abuse and free the caged dogs, but it fell on deaf ears. Mayor Ruben Paulino of Olongapohas the power to end this. The Philippines dog meat trade has a brutal history of mistreatment against dogs in the dog meat trade. It is documented that over 80% of all live dogs being transported to dog slaughterhouses die horrific deaths before reaching their destination! Dead dogs are accepted and processed by dog butchers, so whether dogs arrive dead or alive is irrelevant to dog traders and dog butchers. This is an appalling state of affairs which MUST be exposed! Live dogs are entombed in over-crammed bamboo cages, with their mouth bound tightly shut, rendering them unable to pant to cool their body temperature in the tropical heat. Panic sets in very fast as dogs are rolled and tipped upside down during loading. With their breathing obstructed from having their mouth tied tightly shut and having to bare the dead-weight of other dogs on top of them, dogs are crushed and slowly suffocate to death. DONATIONS: Fight Dog Meat does NOT accept donations. WE HIGHLY RECOMMEND the wonderful animal rescue people at Vietnam Animal Welfare Organization (VAWO), who not only save animals, including dog meat dogs and cats, but also run a Veterinarian Training School to teach local vets how to humanely practice medicine on pets within Vietnam. It is custom that many local Vietnamese vets do NOT USE ANESTHETIC ON DOGS AND CATS DURING OPEN SURGERY!